Maybelline always do an incredible job with their mascaras for the most part, I love their Lash Sensational and Falsies mascara. I have heard great things about their Great Lash mascara too, so when they released their latest mascara I was eager to try it out. It's already gotten a lot of good press in the States, Vegas Nay showcased it on her Instagram and it looked like an amazing mascara, literally like a push up bra for your lashes. So to hear my thoughts, please keep reading. Firstly, let's just go over what is so special about this particular mascara. It claims to deliver major curves and volume, the wand is a unique "push up" wand with patented cup-shaped bristles which retain the maximum amount of formula, scoop and lift the lashes for the perfect fanned-out look. It is also supposed to feel very light on the lashes and hold a curl for longer. Below is an image from +Vegas_Nay on Instagram, on the left she is wearing a strip lash and on the right she is wearing the Maybelline Falsies Push Up mascara and nothing else, and you can see how gorgeous her lashes look. I actually prefer how the lashes frame the right eye. To be frank, I am not very impressed. I think this mascara would be better for people who have quite good lashes already like Naomi (@vegas_nay). I do have decent enough lashes so it did give a dramatic effect, but I thought the overall finish was messy. The formulation is too wet for me, I adore Wayne Goss and because of him I always wipe my mascara wand almost clean before I pop it on my lashes, but with this wand no matter how much I wiped it I still felt there was too much on the brush. It didn't separate my lashes as well as the Lash Sensational or Falsies mascara and it didn't seem to hold my curl very well. I think on short lashes this mascara would be a complete mess, but overall it's okay they have just done better. 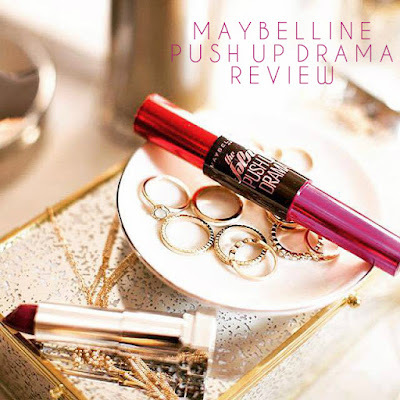 It currently has an introductory price of £5.99 at Boots for a limited time, so you can save £2 as the RRP will be £7.99, standard mascara price for Maybelline. The packaging is really nice, I like the pink and red, I have never seen anything like that before, but at first I thought it was a mascara with two brushes but it's not. Good for people with long lashes already. Could give a false lash effect but you would have to work at it. I didn't like the wand or the formula, it was too thick and the wand felt uncomfortable. Lashes looked more clumpy than "fanned out". I really didn't like it for my bottom lashes, it was quite messy. Here is a short clip of it being applied by @daisie_smith you can see in the clip that it definitely makes your lashes look fuller and more defined, but it isn't so brilliant at separating them so it looks like you have a lot of lashes. I wouldn't really recommend it, but I might just be too fussy. Naomi must have incredible lashes, is all I can say, I wish the mascara had a similar effect on me. Have you tried it? I know a few people who really love it, and thinks it is the perfect volumising mascara, but sadly it just wasn't for me. I didn't do a January Favourites post this year, but I did do a slightly shorter one on my Instagram (@alittlekiran) and I would really like to hear what you have been enjoying since the beginning of 2016 so please leave a comment, I do appreciate it. Have a lovely weekend. Take care. Like you, I love most of Maybelline's mascaras, so I was excited to get my hands on this. As you say, the instagram picture is gorgeous and really sells the product well, so it's a shame that you didn't find it as impressive as you'd hoped! I think I'll stick to my beloved Lash Sensational, instead! The Lash Sensational is a fantastic mascara, I have their waterproof edition and it really clings to my lashes! I really dislike clumpy lashes so I think I'll give this one a miss. Some people adore really wet formulas, so for them this would be a great bargain! Very true, it would be a great mascara for some people, I feel. I think I prefer drier formulas as I really like the Bad Gal Lash mascara from Benefit which many people don't like. Thank you for commenting! I really like the name, I don't know but I think it's funny. I'm a fan of the name and the packaging too, thank you for your comment!